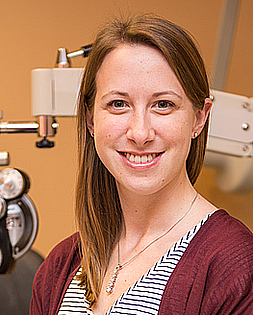 Dr. Sarah Hagedorn was born and raised in Waterloo, Ontario. She received a Bachelors of Biomedical Science degree from the University of Waterloo in 2011 as well as a Doctor of Optometry Degree in 2015. She was named on the Dean’s Honours List for both degrees and received the Good-Lite Paediatrics Award in her final year of study. Dr. Hagedorn participated in a mission trip to Lima, Peru where she performed eye exams for local Peruvians with the Volunteer Optometric Services to Humanity (VOSH) group. Dr. Hagedorn is an active member of the Ontario Association of Optometrists and a local ambassador for the Eye See Eye Learn Program. In her spare time she enjoys travelling, playing ultimate frisbee and horseback riding.